Now that he's on his way to becoming president, Donald Trump has to deal with the difficulty of following through on his ambitious campaign promises. A solid 64 percent of Americans believe Trump will fulfill his promises (whether they like them or not), according to Harvard University’s Center for American Political Studies and the National Research Group. However, we've already seen some potential flip-flops on the use of torture by the military, prosecution of Hillary Clinton, ridding Washington of special interests, the importance of proper handling of national security secrets, and possibly the repeal of the Affordable Care Act. Well, on that last one, he may have flipped back. 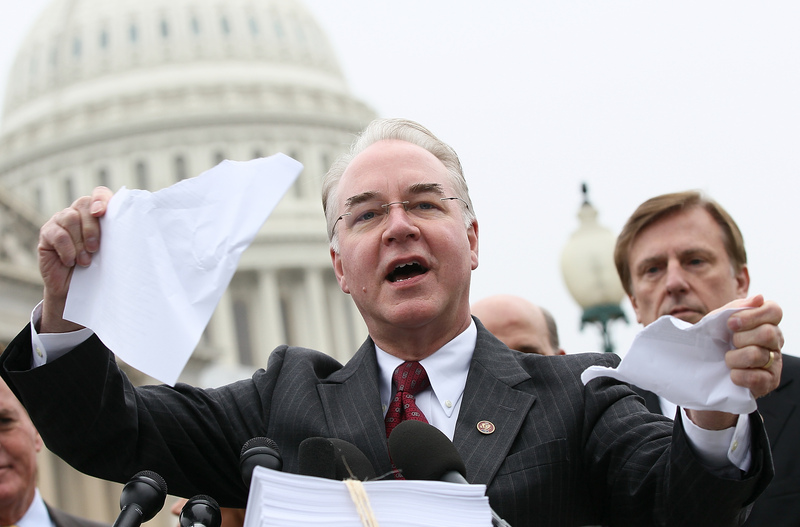 Georgia Rep. Tom Price, Trump's pick to lead the Department of Health And Human Services in his administration, is one of the strongest advocates against Obamacare in the party. He was the author of a bill in 2015 that would have defunded the healthcare program, taking subsidies away from many of the 20 million who receive care through it. But nominating Price for a job handling healthcare is also its own flip-flop on another of Trump's campaign promises — providing six weeks paid maternity leave for new mothers. Trump unveiled a somewhat vague and minimal maternity leave plan in September with the help of his daughter, Ivanka, building on the speech she made at the Republican National Convention about her fathers's commitment to working women. And Tom Price, as a Congressman, voted against paid parental leave for federal employees when a bill came up in the House of Representatives in 2009. While Price's appointment wouldn't necessary mean death for any hope of a family leave policy — he could change his mind since that vote eight years ago, and the Department of Labor (which does not yet have a choice potential appointment) would probably be more important for the policy than Health and Human Services — it is a sign that Trump may already be forgetting about things he advocated for as a candidate now that he's won. Trump giving up on paid family leave shouldn't be surprising — before he flipped on the issue, claiming it was at the behest of his daughter, Trump had previously said that pregnancy was an "inconvenience for a business" in 2004 and told Fox Business News' Stuart Varney that he was against the policy, saying, "I think we have to keep our country very competitive so you have to be careful of it." Trump has a strange meaning of the word "competitive" when it comes to paid family leave — the United States is one of just three countries in the world without paid family leave, joined by only Papua New Guinea and Suriname. There are a lot of things we still don't know about the upcoming Trump administration, but with the president-elect's pick of Price, it looks doubtful that there will be any serious action to bring the United States in line with the rest of the world on taking care of its parents and children.